In another thread there was some discussion about the effect of retarding the spark when descending steep hills. 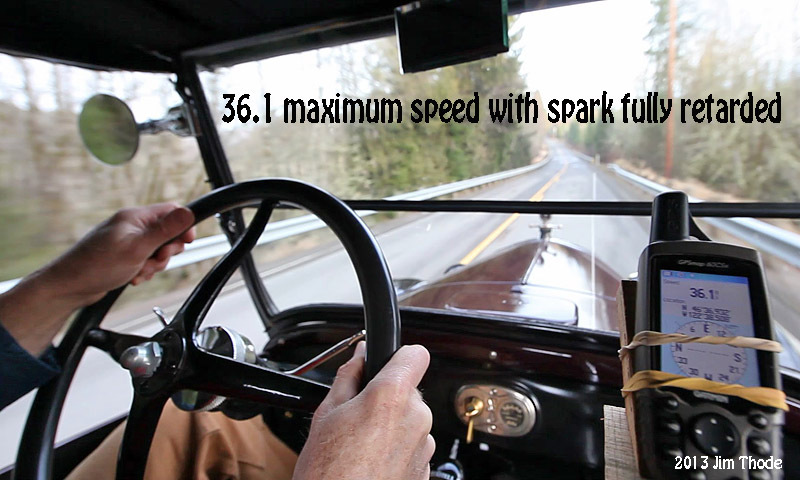 Some felt that retarding the spark had an effect similar to a jake brake on a truck and some really did not think it made any difference. No one had really did any direct comparison to see how it works - until now. The roads were a little cleaner here now so I took the opportunity to do some testing on a nearby hill. Summersett Hill is about 0.4 miles long with a average slope of about 8% and a maximum slope of 12%. I ran down the hill twice, starting at 21mph at the top. On one run I retarded the throttle fully and left the spark control in the normal driving position. On the second run I did the same except I retarded the spark fully. The maximum speed on the hill and the speed when I got to the bottom was slower with the spark lever fully retarded. Not a whole lot of difference but in many cases it could make the difference between needing to ride the brakes or just using the engine for braking. 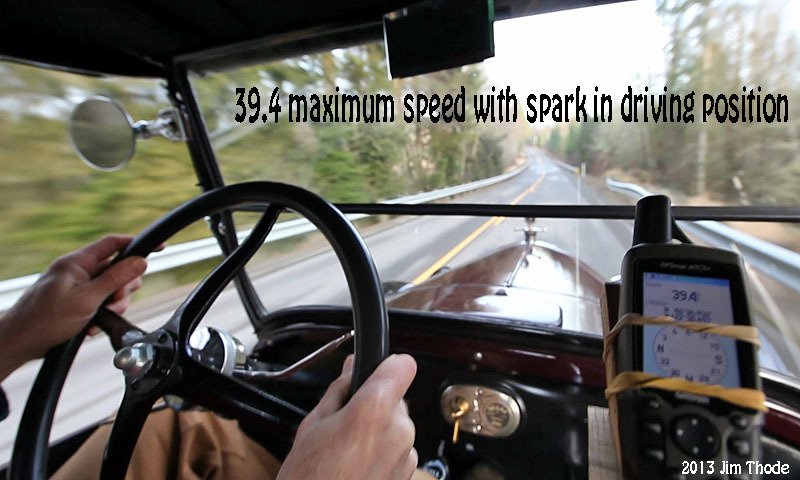 Yes, retarding the spark on steep down hills helps keep the speed down without using your brakes. Another test I would like to see (the coffee is kicking in now) would be on the flat, and putting the throttle up on one test, say at 30 mph, and them, on the same road at the same place, putting both the throttle and spark levers up, and see over a set distance, how much slower you are going when retarding spark and reducing throttle? I did that test last week, but only did two runs, so I did not ever post my results, thinking I would do something more scientific, but just haven't gotten around to it. At 30 mph on fairly level ground, I simply closed the throttle and left the spark where it was. I coasted one block and checked my speed. It was 23 mph. We turned around and drove the same course again, this time retarding the spark in addition to closing the throttle. We got down to 18 mph at the same point. Again, just one test under each condition is not scientific, (And Lord knows I've been accused of that on this forum before), so my intention was to do 5 or so runs under each condition and average the results. It was starting to rain the other day when we were doing this, so we opted to head on to the house before we got wet. I do believe the results would be similar, though. I have seen many do this with good results, however i must ask (I dont have a lot of T driving time as i am currently building my T) what is the risk of warping a valve with this method? I would say the risk is nearly non-existent. You're only running fully retarded for a short while and not under power, so low heat. How is your muffler? It shouldn't have any effect on the valves, because you are drawing in very little fuel, but what fuel does get in will burn after the valves are open and that is the reason for the popping in the exhaust system. Shouldn't you retard the spark at lower engine speeds any way? I do so as moderns do it automaticly. Another safety benefit is that while operating the throttle and steering wheel at the same, you could accidently whack the throttle open with your hand, causing you to lose control as the car charges ahead. It won't charge ahead very fast if the timing is already fully retarded. Well....actually, the engine speed is still up there. I'm not sure how it works on a modern computer controlled one, but say on a centrifugal advance, it would come down slowly with the engine rpm. Vacuum advance may even do the opposite, as vacuum would be pretty high under a high rpm, closed throttle situation. However, like Jerry and Norm said, I don't see there being a problem. I don't get popping in the exhaust when I do it, just a different engine sound. It would be interesting to see how the timing is controlled in modern electrically controlled cars. I know that I tried our modern Toyota on this same hill and I was going about 50mph at the bottom of the hill. Maybe emissions control enter into the picture because the engine is likely not as efficient and pollutes more with the spark fully retarded when the engine is at speed. Charlie asked, "Shouldn't you retard the spark at lower engine speeds any way?" Yes, but if you followed that method in this test you would also advance the spark when then engine speed picked up on the downhill grade. The retarded spark seems to have a greater effect on braking at a greater speed. I just did not start over the hill faster because of a concern of getting too fast at the bottom. Maybe I could try starting over the hill at 30 or 35mph. Probably would be hitting 50+ at the bottom without any braking. So what you are saying is "If your spark is fully retarded then you are igniting the fuel charge at a point before the piston reaches TDC (top dead center)this means the small fuel charge (closed throttle condition) is igniting and trying to send the piston back down before it gets to TDC but because of inertia from the weight of the rotating assembly the piston is driven through anyway causing a moderating effect on engine speed". GEE can I write a text book now? I seem to remember J. C. Whitney selling a manually operated exhaust diverter valve for exhaust whistles. one would have time to turn the mixture knob to closed position. Just my brain cells running wild! I like to set the throttle down so slow the engine almost dies...and does once in a while. That seems to do as much good as retarding spark. I also retard the spark going down hills. Rob Gruber touched on a subject with which I have some experience. 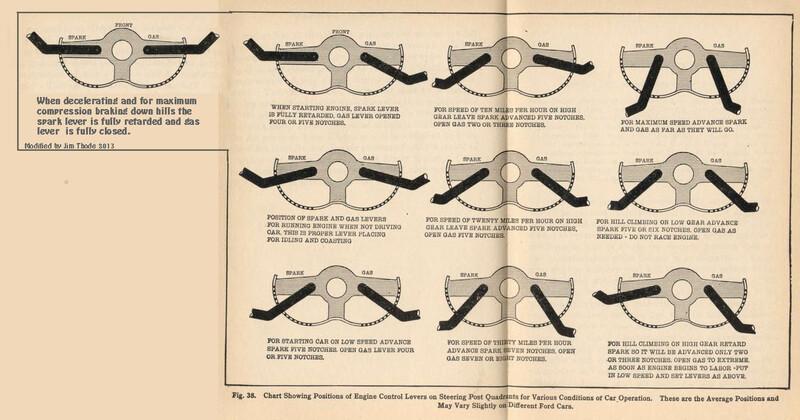 The 27 Tudor I imported from the USA came with the throttle setting which left the motor running at a good idle when the lever was pushed right up. Engine braking with that setting is far less efficient than it is if the fully closed throttle will kill the motor. I have my other Ts set up this way. Yes, I still sometimes get caught not giving them a little throttle when nearly stopped, but it does enable one to drive without undue reliance on the brake pedal. I recall a long down hill drive in New Zealand behind a car in Ruckstel low, and having to constantly re-apply the brakes to keep my distance. With no idle speed, I think I could have stayed off the brakes altogether. Your preferences may be different. Yes, adjusting the idle speed down to a very slow idle or even setting it so the engine will not run when the throttle lever is all the way up makes sense. Some diesels are just like that, to stop the engine just close down the throttle. 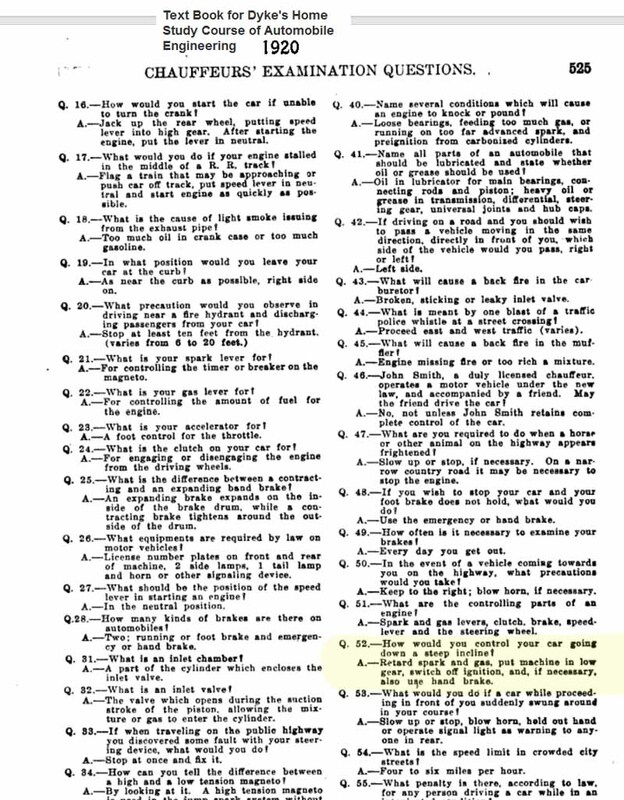 I've see some old (1910 +/-) driving instructions that recommend shutting off the ignition for maximum braking when descending hills. I have not tired it but it would seem that if there is still much gas being pumped through the engine that you would risk blowing up the exhaust system when the ignition is turned back on.